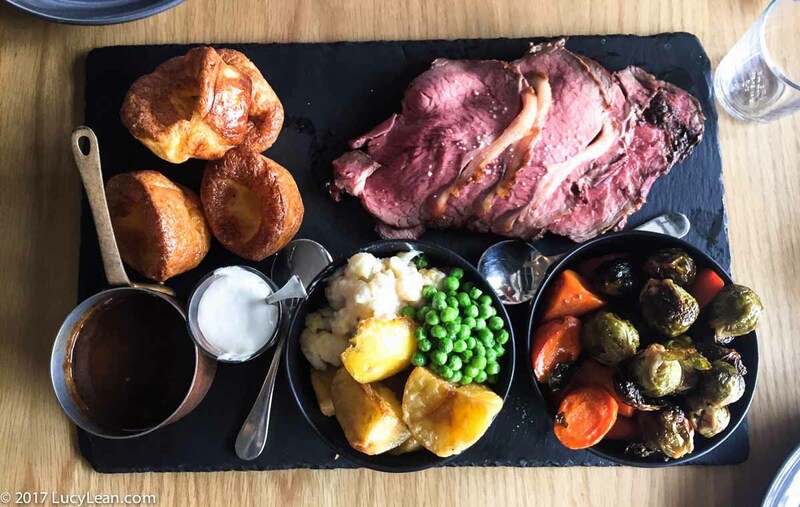 We have been loving Sunday Roast at Birch in Hollywood – thanks to fellow Brit, Brendan Collins it’s authentic, delicious and the best cure for any homesickness for Blighty. Not only does he make the perfect Yorkies – fluffy and flavorsome and the meat is juicy and tender – he’s also pretty good at that other family favorite roast potatoes. 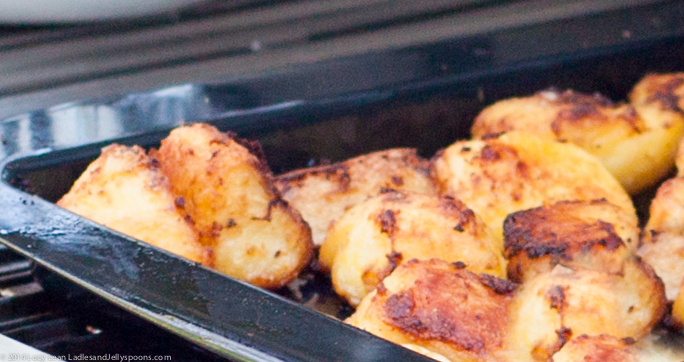 The best roast potatoes are crispy on the outside and soft and light on the inside. I know mashed potatoes are more traditional in America for the Thanksgiving table – but they are also a delicious addition to your turkey dinner and one I can’t eat without! 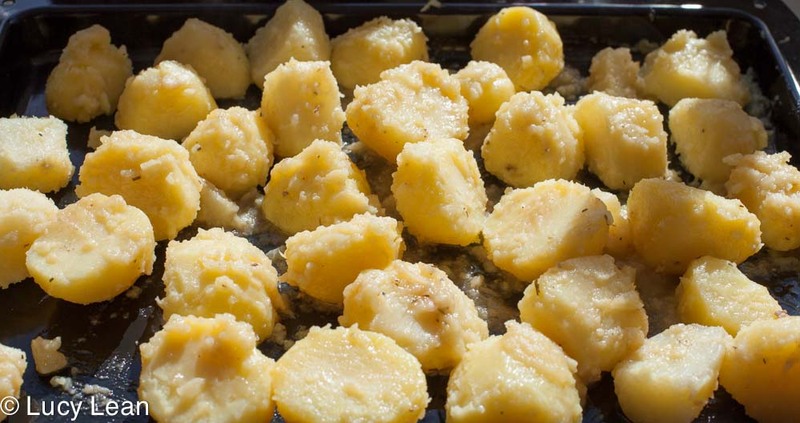 Make perfect crunchy roast potatoes every time by following these simple instructions – the key to crispy potatoes is a good shake and sizzling hot fat! 1. Pre-heat the oven to 425°F. Add the drippings or butter/lard to a large heavy bottomed roasting pan and place in the oven. Add an inch of water to a large saucepan and bring to a boil over high heat. Boil a kettle of water. 2. Peel potatoes with a potato peeler and cut into even sized pieces. 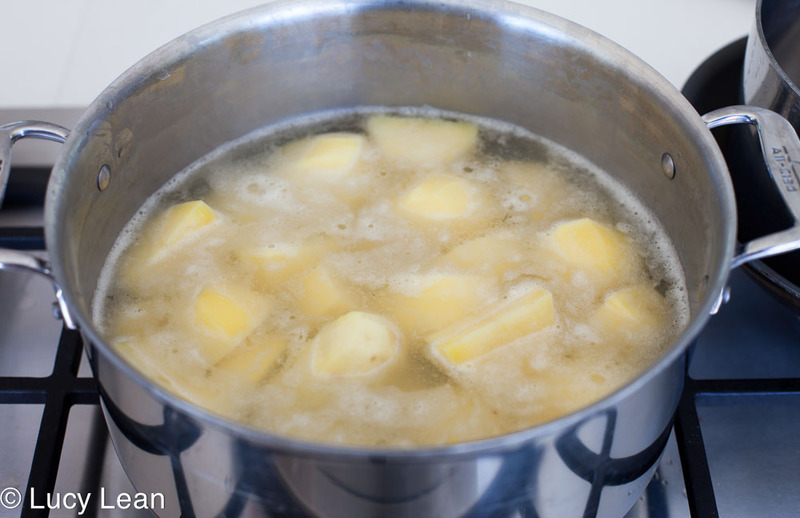 Place potatoes in the saucepan of boiling water and pour over additional boiling water from the kettle so that the potatoes are just covered. 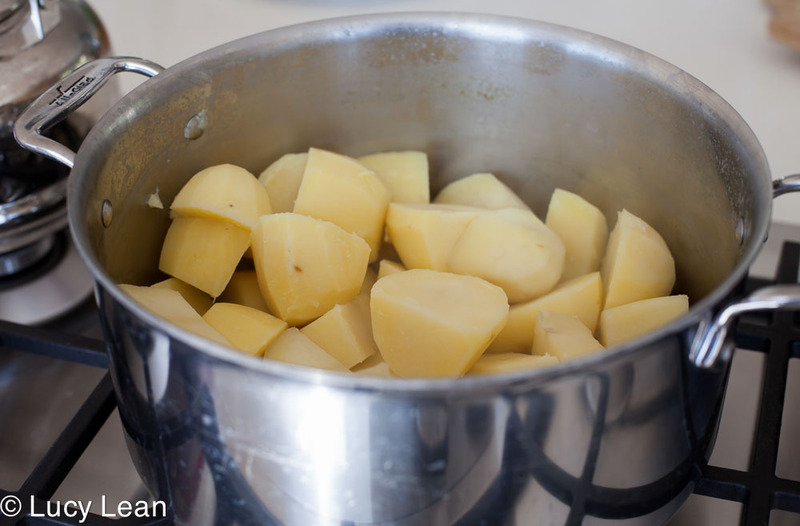 Add salt and simmer until the edges of the potatoes are just going fluffy on the outer edge, about 10 mins. 3. 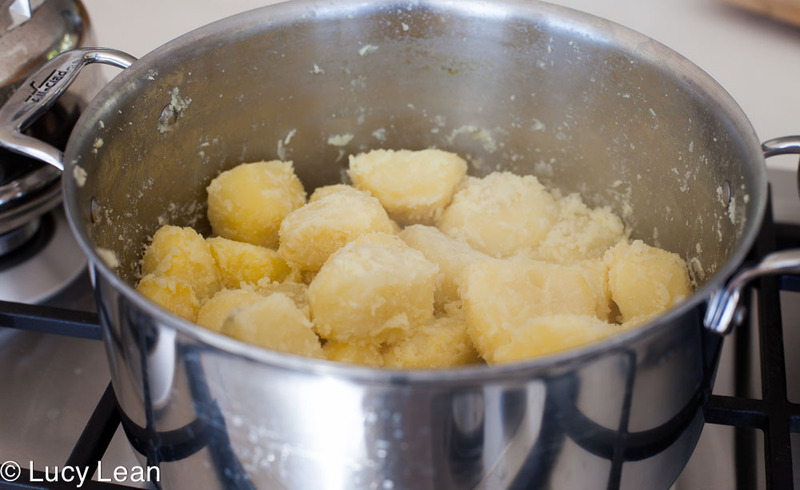 Drain off water and let potatoes sit for a couple of minutes in the pan without the lid on to get rid of excess steam. Place lid back on saucepan and holding in place firmly either side shake the saucepan as hard as you can. This will fluff up the potatoes which gives them the extra crunch once roasted. 4. Remove the hot roasting pan of sizzling fat from the oven and place on the stovetop over medium heat. 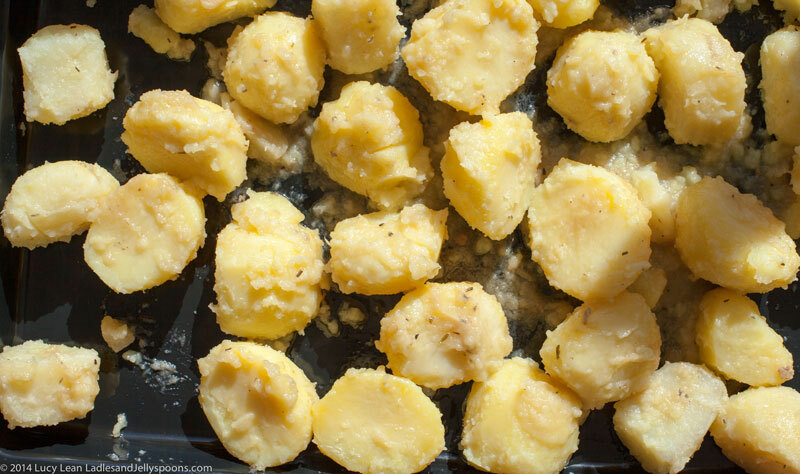 Add the potatoes to the hot fat and baste in the fat – you want them all covered. 5. Roast in the oven until golden brown, about 40-50 minutes. You may want to turn them over after about 20 minutes if the bottoms are browning before the tops. 6. Sprinkle with fleur de sel and serve alongside roast meat.